Work on one-year-old project at the garden managed by the Delhi government has been stalled from the past five to six months. Ground work for the project started in December, 2017. 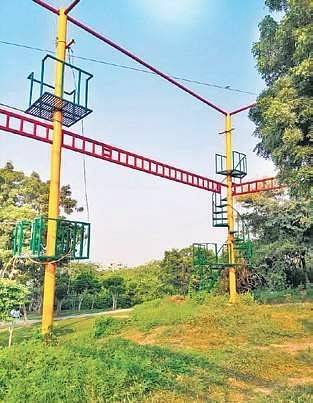 NEW DELHI: An ongoing tussle between the New Delhi tourism department and a private company contracted to develop adventure sport activities at the Garden of Five Senses in the National Capital has brought the project to a halt. Work on one-year-old project at the garden managed by the Delhi government has been stalled from the past five to six months. Groundwork for the project started in December, 2017. “The company which we hired for developing adventure activities at the park, encroached upon more land than they were supposed to. A show cause notice was served to them but instead of responding to the department, the construction company went to the High Court. It is unfortunate that we chose this company,” said C Arvind, General Manager of the Delhi Tourism and Transportation Development Corporation (DTTDC). According to sources in the department, the trouble began when the forest department noticed that forest land has been encroached and, as many as 15 trees had been chopped by the contractor without requisite permission, following which the notice was sent out. In response to the tourism department’s notice, the contractor filed a petition in the High Court stating that they had already installed equipment several sections of the garden and any change would cause the company losses. Tourism department officials familiar with the matter said an arbitrator had been appointed by the Delhi High Court to find an alternative and get the project going again. The 20-acre park is situated in Said-ul-Azaib village near the Saket metro station.